NEWS UPDATE: Kogi State Governor visits Minister of Agriculture, wants Kogi to be pioneer state for FG's cattle colony programme. The Governor of Kogi State – Alh. Yahaya Bello was today received by the Hon. Minister of Agriculture and Rural Development – Chief Audu Ogbeh on a courtesy visit in Abuja. Governor Bello who was accompanied by his Commissioner for Agriculture - Mr. Oloruntoba Kehinde and Special Adviser on SDGs – Arc. Abdulraheem Okara, said he was visiting the Minister to acquaint him on the progress being made in the agricultural sector in the state; seek FG’s support for specific programmes including the management of the Silos in Lokoja and to request that Kogi State be the pioneer state for the planned cattle colony programme of the Federal Government. According to the Governor, the state has effectively managed herders/farmers peaceful co-existence so far through regular stakeholders’ consultations and the inclusion of the cattle breeding community in the traditional administration of the various communities. The Governor also briefed the Minister on the giant strides recorded by the state in livestock, dairy and rice production. With the recent unveiling of Kogi's ‘Confluence Rice’, Gov. 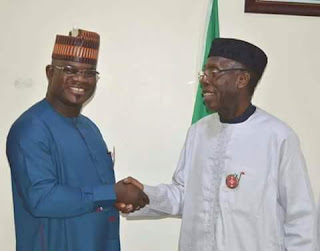 Bello said the local rice would be available in the 10 neighbouring states, upon the complete installation of Kogi rice Mill with a milling capacity of 50 tonnes per day by the end of the first quarter of 2018. Hon. Minister, Chief Audu Ogbeh congratulated the Governor for his foresight and interest in the new cattle breeding programme and commended his general achievements in agriculture. Chief Ogbeh noted that Kogi State is very important to Nigeria’s Value Chain Development Programme especially in Cashew and Cassava: “Kogi is the largest producer of cashew nuts in Nigeria and your large production capacity in Cassava has great foreign exchange potential through the production of ethanol, syrup and industrial starch. Kogi state has been earmarked for massive land clearing this year and we are also looking at establishing a cashew processing factory in the state. ", he said. Present to receive the Governor during the visit were the Permanent Secretary – Dr. Bukar Hassan; some Directors in the Ministry and Special Advisers to the Hon. Minister.